AN ANTI-VIOLENCE INITIATIVE TO REDUCE ALL YOUTH GANGS AND GUN VIOLENCE. THE ANNUAL “SILENCE THE VIOLENCE AND SHUN THE GUNS' GIVEAWAYS” BEGINS TODAY, EVERY DAY FOR THE MONTH OF FEBRUARY OF 2019! Share to qualify for a chance to win one of the most popular items in our product line, the standard Silence the Violence and Shun the Guns t-shirt. It is has been the t-shirt of the year for two consecutive years. Here's how you can have a chance to win one. 1) Go to the second image, copy and then post the t-shirt giveaway image on your Instagram account. And don't forget to add @silencetheviolenceandshun #silencetheviolenceandshuntheguns so we will be alerted and keep track of all participants. 2) Encourage your followers to do the same. All participants must reside in North America. For every new 20,000 followers that we gain, we will randomly select a winning follower. The confirmed winning follower will be shipped a standard Silence the Violence and Shun the Guns t-shirt. Allow approximately 5 to 10 business days for delivery from the date of shipment. The more people you get to follow us, is the faster we will announce a random winner after determining if the potential winner has heavily promoted this giveaway. 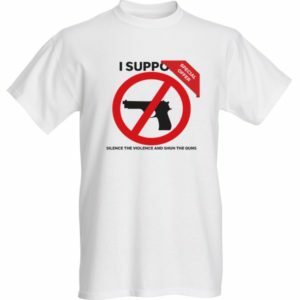 The odds in winning a standard Silence the Violence and Shun the Guns t-shirt is 1 in 20,000 participants. There is no limit on how many times a participant can win. Silence the Violence and Shun the Guns will make the random selections and all decisions are final. Any abuse that places a participant in unfair advantage over the others will be disqualified. If you are a winner, when you receive the t-shirt, post yourself wearing the t-shirt using our hashtag. 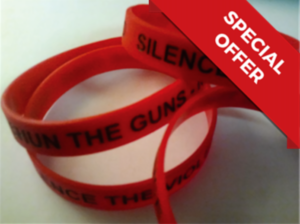 And then, you will be automatically entered to win a standard Silence the Violence and Sun the Guns wrist bracelet. If you fail do so with 24 hours after delivery has been confirmed, you and your followers who had participated will be illegible to have a chance to win any further items. The odds in winning a standard Silence the Violence and Sun the Guns wrist bracelet is 1 in 10,000 participants. The same rules to qualify to win a t-shirt, applies to the wrist bracelet giveaway. 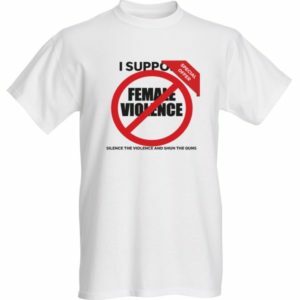 Copyright © 2019 SILENCE THE VIOLENCE AND SHUN THE GUNS INC.